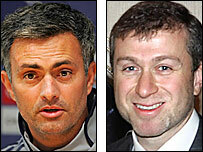 Is owner Abramovich being won round by manager Mourinho? Chelsea boss Jose Mourinho exchanged a celebratory hug with club owner Roman Abramovich as their relationship showed signs of improvement. The pair embraced after Chelsea's 2-1 extra-time win over Blackburn in the FA Cup semi-final on Sunday. "I have met him and we had a hug," said Mourinho, whose future has been in doubt following claims he has fallen out with Abramovich. "I told him congratulations and he said the same. That is normal." Mourinho has asked the Stamford Bridge club to break their silence about his future, but Abramovich has still to reveal his standing on the situation. The Chelsea boss has received the backing of club chief executive Peter Kenyon but says the directors have not yet given him any guarantees. Mourinho's contract runs until 2010 and he has repeatedly said he wants to stay at the club. 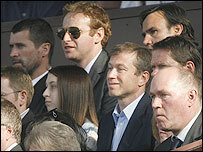 The embrace between Mourinho and Abramovich came in the directors' box at Old Trafford after the win over Blackburn set up an FA Cup final against Manchester United at Wembley on 19 May. Chelsea are also still vying to add the Premiership and Champions League trophies to their Carling Cup victory as they chase an unprecedented Quadruple. Blackburn gave Chelsea a scare and could have won it if Morten Gamst Pedersen had done better than send a free header wide after 83 minutes. "I was afraid," said Mourinho. "If they had scored at the end of normal time, the game would probably have been over but my team were heroes again." Mourinho singled out keeper Petr Cech after he made some vital saves to keep Blackburn at bay. Cech was sidelined for three months after undergoing surgery on a fractured skull because of an injury picked up against Reading. "Petr Cech is more than special," stated Mourinho. "He is the best goalkeeper in the world, everybody knows that, but to be the best in the world three months after that incredible surgery is amazing. "When we saw him at Reading and then in the hospital, without hair and with a big scar, and then when he was trying all his different helmets on, there were a lot of question marks. "We didn't know whether he could come back and still be the same. "To come back and be so good, so quickly is fantastic." Chelsea play West Ham on Wednesday before facing another Premiership match at Newcastle on Sunday and a Champions League semi-final, first leg against Liverpool three days later. The Reds played out a 0-0 draw with Manchester City on Saturday and Mourinho said: "One of my assistants went to watch and he left after 60 minutes because it was like a testimonial match. "We have just played for two hours, then in three days we have a match at West Ham which we have to win and on Sunday we have another at Newcastle where we are in exactly the same position. "The way the matches are in this country is unbelievable." Chelsea could also play Manchester United three times in a fortnight for a shoot-out for the Premiership on 9 May, FA Cup on 19 May and possibly the Champions League final on 23 May. "I wouldn't be sad if we had to play them three times in a fortnight," he said. "The way we have both played this season is absolutely unbelievable. We are both still fighting for the three major trophies, which is amazing. "What we have to try to do is make sure our league game against them at Stamford Bridge is a final. "We have to keep this run going and make sure we go into that game with a chance to be champions."